The past two weekends I was back home in Jersey celebrating Chinese New Year with my family. There's much to do in preparation for these two feasts. But let me just start with a brief history that my mom and my Auntie Cynthia have shared with me over the years behind the traditions of Chinese New Year feasts. The Chinese tradition behind preparing New Year feasts calls for particular ingredients with names suggestive of good omens. These names have homophonic qualities (as Chinese dialects have multiple inflections on the same sound) in that the Chinese word or words for that said ingredient sounds exactly the same as another Chinese word that represents a particular good omen, yet are signified with different Chinese characters. For example, the two dinners I come home for, tün leen faan and hoy leen faan, have double meanings. Tün leen faan, the feast served before the actual date of the New Year (in our case, it was the weekend before), literally translates to mean "all year feast," which is bringing family together (tün) to bid farewell to the past year (leen) through a big feast (faan). The same goes for hoy leen faan, which is "open year feast," for welcoming (hoy) the New Year (leen) with another feast (faan). Incidentally, faan is also a metonym, as it is actually the word for "rice" (a key Chinese dining staple, as we all know), but can also mean an everyday meal or a special feast. A week before the New Year, Auntie Cynthia buys a batch of freshly cut branches of a Chinese plum blossom tree and puts them in this really pretty vase alongside two pomelos and a couple Mandarin oranges. 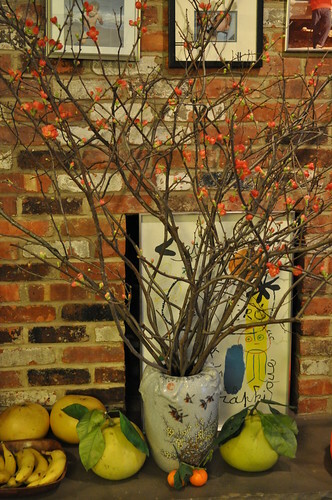 The blossoming of this type of tree occurs in January and February, typically coinciding with Chinese New Year, perpetuating the "blossoming" prosperity and good fortune for the New Year. 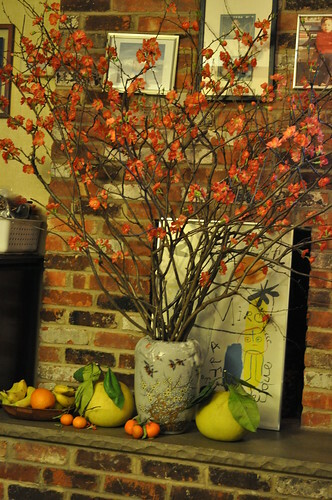 By setting this up a week before, it will give the flowers plenty of time to blossom in time for the New Year. The Chinese also believe in having a pair of pomelos (yow), with leaves intact, in the house during the New Year celebration, because to them, good things always come in pairs. Using the pomelos to decorate during the New Year implies a wish that the home will have everything it will need in the coming year, as yow also means "to have". The same goes for Mandarin oranges (kum), as kum also means gold in Cantonese, a sign of prosperity. A week later, here are the flowers, fully blossomed! 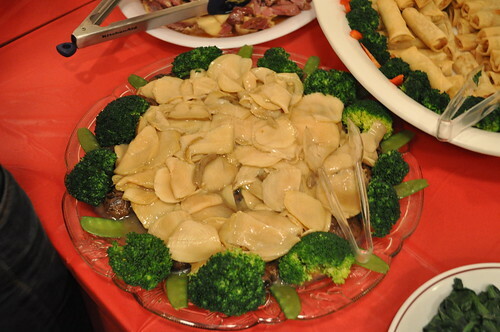 Additionally, the presence of these particular ingredients indicates the culinary observation of the Chinese high holiday: bao yu (i.e., abalone, a gastropod mollusk), shark fin, and faat choy (i.e., Chinese algae, also known as dried black hair moss). These three ingredients, each usually present in three individual dishes, are delicacies in the world of Chinese cuisine. Families often pay large sums in order for their New Year feasts to be complete. 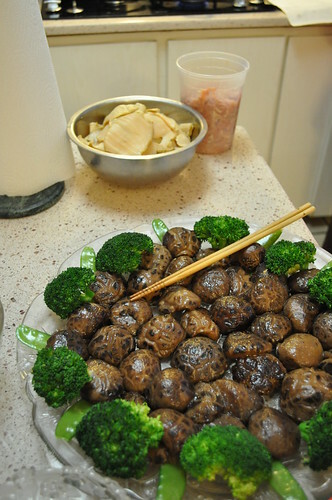 My mom plated Chinese mushrooms on this dish above, garnished it with broccoli and snap peas, preparing to put abalone on top (seen in plastic container). Final bao yu dish served with Chinese mushrooms and snap peas. Coincidentally, abalone has a parallel meaning of assurance (bao) of a surplus (yu) in the year ahead, following the superstition of good omens. I forgot to snap a photograph of the faat choy (the aforementioned Chinese algae/black hair moss) and ho see (i.e., dried oysters), so I borrowed this one from avlxyz on Flickr. Chinese algae are also informally referred to as "Nun's Hair" because of the appearance. The combination of faat choy and ho see go hand-in-hand as they directly translate to, respectively, good fortune and good business. Dried oysters are definitely an acquired taste--it is definitely not a dish many people drool over, but it is certainly something of which you need to take a bite to properly welcome the New Year. Nun's Hair, on the other hand, has an interesting consistency to it. It is somewhat crunchy and chewy at the same time, true to its algae/seaweed nature. Shark fin soup is always served at Chinese celebrations (New Year feast, weddings, etc.). As it is a rare delicacy, and quite expensive to buy, it is a way of showing that you've saved up during the current year to be able to enjoy this delicious soup with friends and family on a momentous occasion to welcome the new year. 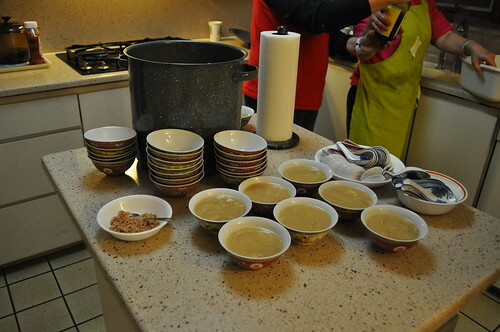 My aunt used ten fresh chickens and some fresh pork meat to make the soup's stock. Once the sweet and savory flavor of the ten chickens and the pork meat make its way into the stock, they are discarded. 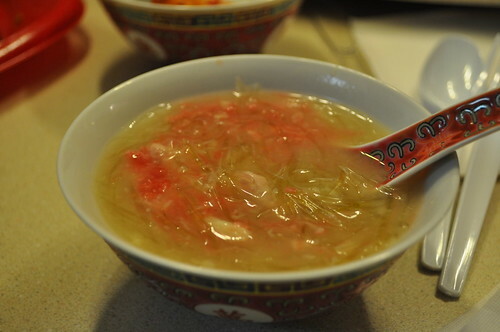 Prior to serving, she cut up thin pieces of chicken thigh meat and added it to the stock along with the shark fin (another labor-intensive process in cleaning and preparing). When served, we sprinkle finely chopped aged ham on top and splash a little red vinegar for a little extra flavor. 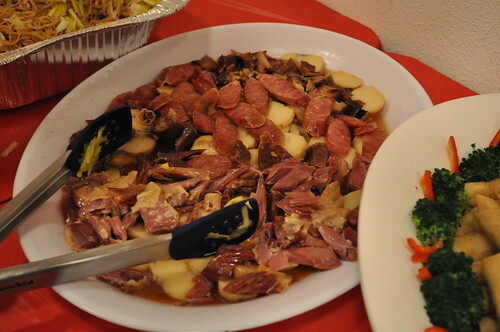 This dish, chi goo (i.e., water lily chestnuts) is typically served with Chinese sausage, preserved duck, and preserved pork. Water lily chestnuts are served to represent “fertility,” particularly in bearing male children for the family (a very traditional Chinese belief), as chi goo resembles (and also signifies) male genitalia. 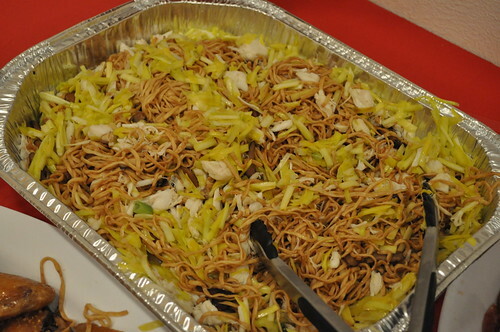 Auntie Cynthia has a special supplier for these noodles--they import their supply all the way from Hong Kong! Noodles are always served at celebratory events (especially during celebrations of the New Year) to signify long life in the years ahead. Definitely one of my all-time favorites at our family dinners. The noodles have a nice balance of chewiness and crunchiness (what the Cantonese refer to as song). It's a quality I have a hard time translating into English, so hopefully one of these days I'll be able to figure it out! 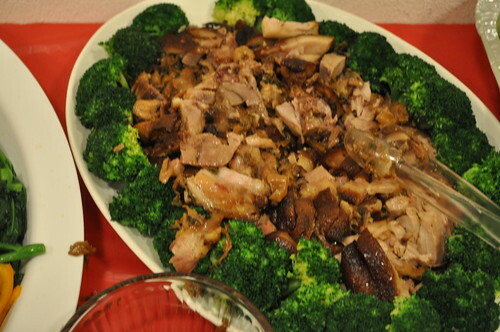 This is pork shank served with a broccoli garnish. The meat was very tender and soft, with a delicious Asian meaty flavor to it. This dish is probably the most labor intensive of them all in terms of preparation. Fish (yu) sounds similar to the Chinese word for surplus. Additionally, the type of fish preferred for the New Year is the carp (lei yu), and lei means interest or profit, reinforcing the concept of prosperity. After washing the whole carp fish, you must remove and save the fish meat, its head, and its tail, while keeping the skin intact and discarding all of the remaining bones. On the side, you must finely chop fresh shrimp along with the fish meat, which will slowly turn into paste once it is fully chopped. Then you season the paste with finely chopped cilantro, a dash of salt, some white pepper, and a little soy sauce. You then stuff the paste back into the fish skin, shaping it to resemble the initial carp and cook accordingly. 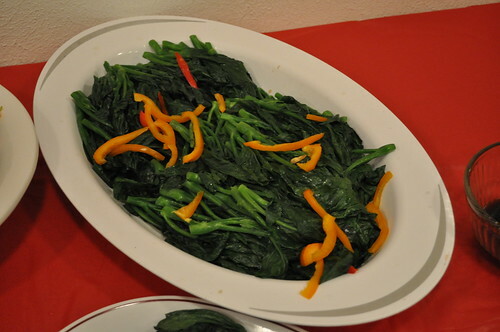 As most Chinese dinners dictate, a dish of vegetables is a must! This dish consists of a chopped mixture consisting of dried oysters, pork, and water chestnuts, with which you fill the lettuce wraps. 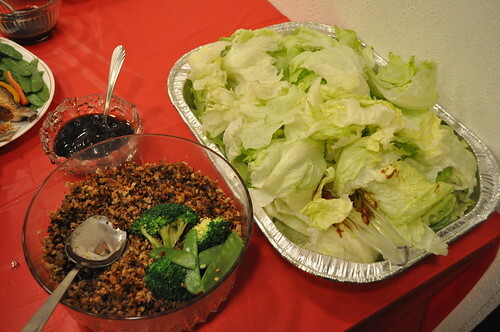 Lettuce (sang choy) has a similar sound to liveliness (sang mang). 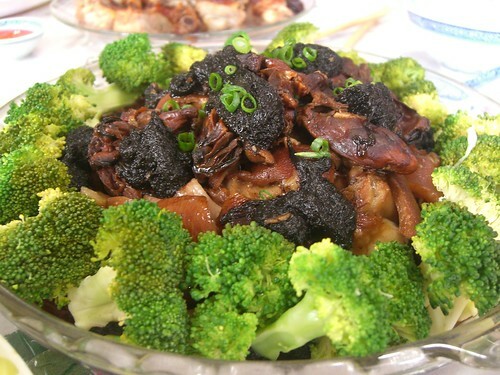 The use of dried oysters (as mentioned above, ho see) adds good business to this dish as well. 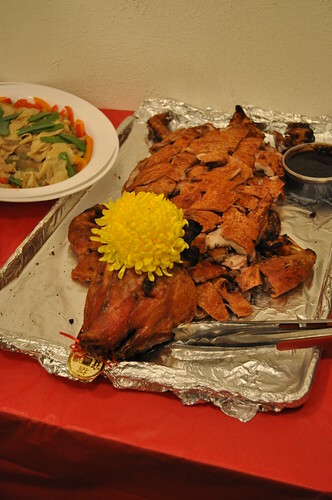 To top off everything else, the most spectacular dish of all is the roast suckling pig. As I've mentioned (in explanation and visual evidence) previously in my birthday toast to my godmother back in October, the Chinese believe that serving a whole roast pig is a good omen--the harmony of the whole. Also, the golden red color of its crisp, roasted skin adds to the auspiciousness of this dish. For the Chinese, red is symbolic of good fortune and happiness. Here's a close up of the pig's head. 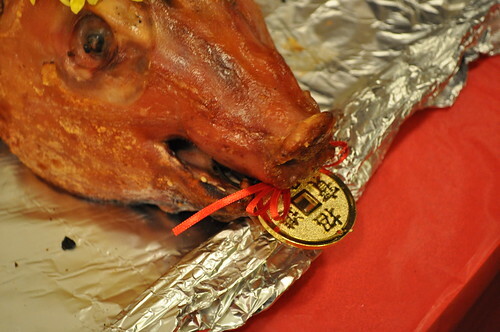 My aunt cleverly placed this Chinese medallion in its mouth for an extra little something--a lucky gold coin! We also had prawns (photo not shown), which have connotations of happiness--the larger the prawn, the more implied joy and happiness will lay ahead in the New Year. Along with the theme of homophones and good omens, the connotation of happiness here is derived from the Cantonese word for prawn (ha) and laughter (ha-ha seew). 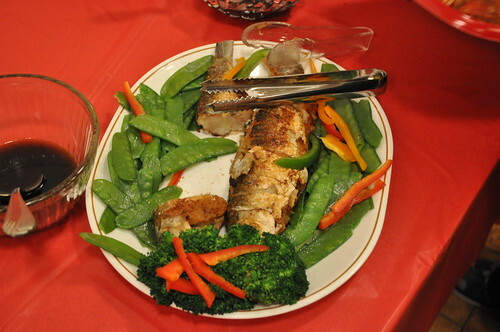 Findings: It was a great meal to share with close family and friends -- I look forward to the bright reds and golds during this time of the year. It was especially wonderful this year because I took the time to ask my family and research online about the High Holiday's history, meanings, symbolism, etc. I have a greater appreciation of my family's culture and traditions, and I hope that I'll be able to carry on all of these good omens when it's my generation's turn to host these events together. On a completely separate but coincidental note, this is my 88th post on Four Tines and a Napkin! What a great omen to start the new year, as 8s are good omens for the Chinese!